Vajra (Sanskrit: meaning thunderbolt and diamond) refers to an important sacred tool and ritual implement in Vajrayana Buddhism, Hinduism and Tantra where it symbolizes the male principle of creation and represents both method and "Upaya" (skillfull means) in religious practice. When made to be worn as a pendant, it reminds the wearer, and the viewer, of the supreme indestructibility of knowledge. In the tantric traditions of Buddhism, the vajra also symbolizes for the nature of reality, or sunyata. Vajrayana (meaning "Thunderbolt Way") is one of the three major branches of Buddhism that derives its name from the Vajra. The Tibetan word for vajra is dorje, which is also a common male name in Tibet and Bhutan. Dorje can also refer to a small sceptre held in the right hand by Tibetan lamas during religious ceremonies. Both the religions of Hinduism and Buddhism utilize the vajra in their religious mythology, symbolism, and philosophy. The vajra is a particularly important ritual implement in Tibetan Buddhism, which is also called Vajrayna (meaning "Thunderbolt Raft" or "Diamond Vehicle"). Vajrayana Buddhism derives from several sources including the practice of tantric Hinduism, which flourished in India between the eighth to tenth centuries. During this time, Mahayana and tantric ideas were imported into Tibet and assimilated with local religious practices to develop a distinct form of Buddhism that became known as Vajrayana. This branch of Buddhism elevated the Vajra the supreme symbol of Enlightenment. The term is employed extensively in tantric literature: the term for the spiritual teacher is the vajracarya; instead of bodhisattva, we have vajrasattva, and so on. The practice of prefixing terms, names, places, and so on by vajra represents the conscious attempt to recognize the transcendental aspect of all phenomena; it became part of the process of "sacramentalizing" the activities of the spiritual practitioner and encouraged him to engage all his psychophysical energies in the spiritual life. In Hindu mythology, Vajra is the weapon of Indra, the Vedic god of war and king of the devas. In Hindu mythology, the vajra is a powerful weapon having the combined features of sword, mace, and spear. It was created out of hard thigh bones of sage Dadhichi who gave up his life willingly for a noble cause so that his spine could be used to build the weapon. This was the weapon that Lord Indra used to kill Vritrasura who had conquered heaven and terrorized the gods. Due to this supreme sacrifice, sage Dadhichi became a legend. Vritra, the serpent of drought had swallowed the cosmic waters. Indra split the serpent's stomach using the vajra, releasing the waters. 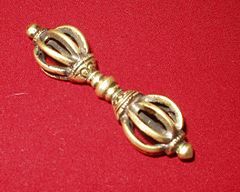 The Vajra is believed to be made of sage Dadhichi's bones. The vajra is also extensively used in the rituals of the tantra where it symbolizes the male principle that represents method, while the Bell symbolizes the female principle representing compassion. Their interaction leads to enlightenment. In addition, the Vajra represents "Upaya" (skillfull means). When made to be worn as a pendant, it reminds the wearer, and the viewer, of the supreme indestructibility of knowledge. In the tantric traditions of both Buddhism and Hinduism, the vajra is a symbol for the nature of reality, or sunyata, indicating endless creativity, potency, and skillful activity. According to Buddhist mythology, the vajra destroys all kinds of ignorance, and itself is indestructible. Various figures in Tantric iconography are depicted holding or wielding the vajra. Three of the most famous of these are Vajrasattva, Vajrapani, and Padmasambhava. 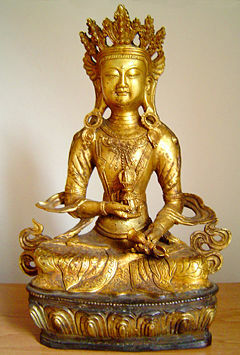 Vajrasattva (lit. vajra-being) holds the vajra, in his right hand, close to his heart. The figure of the Wrathful Vajrapani (lit. vajra in the hand) brandishes the vajra, in his right hand, above his head. Padmasambhava holds the vajra above his right knee in his right hand. In the center is a sphere that represents Sunyata, the primordial nature of the universe, the underlying unity of all things. Emerging from the sphere are two eight petalled lotus flowers. One represents the phenomenal world (or in Buddhist terms Samsara), the other represents the noumenal world (or Nirvana). This is one of the fundamental dichotomies perceived by the unenlightened. Arranged equally around the mouth of the lotus are two, four, or eight mythical creatures, which are called makaras. These are mythological half-fish, half-crocodile creatures made up of two or more animals, often representing the union of opposites (or a harmonization of qualities that transcend our usual experience). From the mouths of the makaras come tongues that come together in a point. The five pronged vajra (with four makaras, plus a central prong) is the most commonly seen vajra. There is an elaborate system of correspondences between the five elements of the noumenal side of the vajra, and the phenomenal side. One important correspondence is between the five "poisons" with the five wisdoms. The five poisons are the mental states that obscure the original purity of a being's mind, while the five wisdoms are the five most important aspects of the enlightened mind. Each of the five wisdoms is also associated with a Buddha figure. Bucknell, Roderick S., and Martin Stuart-Fox. The Twilight Language Explorations in Buddhist Meditation and Symbolism. London: Curzon Press, 1986. ISBN 9780312825409. Tsoṅ-kha-pa Blo-bzaṅ-grags-pa, and Gareth Sparham. Tantric Ethics An Explanation of the Precepts for Buddhist Vajrayāna Practice. Boston, MA: Wisdom Publications, 2005. ISBN 9780861712908. This page was last modified on 14 January 2016, at 16:08.